The chief executive of the parent company of Aer Lingus has said he does not see any circumstance in which a hard Brexit would lead to flights being grounded. 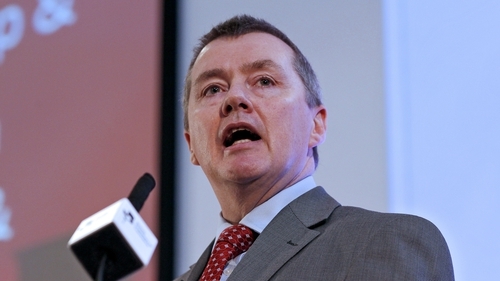 Speaking in Dublin last night, IAG chief executive Willie Walsh said he does not think anyone can predict what is going to happen with Brexit, but the group he leads is relaxed about the situation. "It has to play out and it will play out," the former Aer Lingus and British Airways boss said. "I'm not going to predict what will happen politically. But I think from an aviation point of view without question there will be a comprehensive agreement." He also scotched suggestions that there could be a cap put on flights from the UK to the EU post-Brexit, because there is legal framework there that must be observed. "Consumers don't want to see a cap on flights because a cap on flights is just going to reduce capacity and reduced capacity means higher pricing," he said. "And nobody wants to see that and it certainly wouldn't be in any consumer's interest to see flights being capped around Europe." "This is a time for people to be calm and ultimately we'll see this being resolved." Mr Walsh, who was in Dublin to speak at an Aviation Club UK event, added that it was up to politicians to act. "I can't find any country in the EU 27 or the UK who wants to see flights grounded," he said. "I can't see it happening. Politicians make the decisions, so it can't be out of their hands. It is not like we are being told what to do by some anonymous entity somewhere." "The people making these decisions are people we all know and it's ultimately a decision for all of the governments, the EU 27 governments." "We're relaxed about this, we'll watch it we'll contribute to the discussion, but we'll contribute in mature way," he added. "We are not going to get excited and we're not going to jump up and down about this and I think that is what is needed at a time like this." He added that the UK market is such an important part of the European market. "The EU prides itself on being able to negotiate comprehensive air service agreements with countries around the world," he told journalists. "They'll do the same with the UK and the UK wants to do the same with the EU," he added. In relation to the future of Norwegian Airlines in which IAG has bought a 4.6% stake, Mr Walsh said his group remains interested in buying the low cost carrier, but would not engage in a bidding war. He said Norwegian is a good brand, has an interesting network and while it is struggling financially today it is not beyond people to resolve that. "That means Norwegian will be a different Norwegian than it is," he said. "It could be part of another group or they will downsize, so I don't buy into the idea that Norwegian disappears. I think Norwegian in some form will continue." He said IAG, which already owns Iberia, Aer Lingus, British Airways and others, has taken a view and expressed an interest in Norwegian because it wants to expand into that market. But he said that offer is both time and price limited. Speaking about the possibility of a third terminal at Dublin Airport, Mr Walsh said that is not something that IAG is interested in. He said Dublin is a great airport and clearly very important to the company, but he claimed that there is a lot of things that it needs to do. He added that the management of the Dublin Airport Authority is focused on those issues. Mr Walsh also said he regrets that British Airways did not do a deal to join up with Dutch airline KLM, which is now part of the Air France-KLM group. He said if the two carriers had got together it would have been fantastic. The Dubliner said Aer Lingus has done a great job in tough conditions, but does benefit from having fierce competition from Ryanair on its doorstep. He predicted there would be more consolidation in the airline industry, adding that there were too many airlines incapable of making the return that would justify the investment that is required.